BP and Beyond Limits Explore the Pinnacle of the Artificial Intelligence Pyramid. We’ve partnered with BP to bring Cognitive AI to Oil and Gas. The latest issue of the Journal of Petroleum Technology highlights our work with BP’s petrotechnical experts to integrate cognitive AI in never-seen-before ways. Beyond Limits has built a cognitive reservoir management advisor for operators who want to dramatically accelerate data integration and analysis to pinpoint drilling opportunities, weigh opportunity vs. risk, and speed up time to decisions. Beyond Limits has developed a cognitive AI solution called Well MD™ well health advisor. The system utilizes historical data, real-time sensor data, human knowledge, and our cognitive reasoning technology to maintain a well’s health and production over time. Almost as important as the analysis an AI system provides is explainability. Because Beyond Limits customers use our cognitive solutions to analyze and support high value decisions, the AI system must be able to explain its reasoning. Unlike conventional “black box” approaches like machine learning, deep learning or neural networks that cannot explain their reasoning, all Beyond Limits cognitive AI solutions are capable of delivering clear explanations of reasoning and evidence in transparent audit trails, including risk, uncertainty and facts. 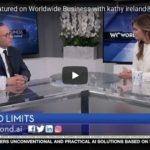 CEO of Beyond Limits, AJ Abdallat talks to World Business with Kathy Ireland about the Future of AI.